- In the Likud party convention, Sharon is defeated in the leadership race. - Netanyahu is elected leader of the Likud bloc. - Likud splits into Sharon and Netanyahu factions. - Sharon faction forms alliance with the (Israeli) Labor Party and other leftwing factions to fight elections to the Knesset. - The Sharon faction- Labor alliance is supported by Gush Shalom (Peace Now). - The Netanyahu Likud bloc sweeps polls and forms the government. - Abbas is threatened by Hamas with death. - In-fighting among Palestinians between the Palestinian Security forces led by Dahlan and Hamas. - Aborted assassination attempt on Abbas. - Abbas resigns as President and relocates to Cairo. - Hamas celebrates Abbas' exit as second major victory after withdrawal of Israeli settlements from Gaza. - Hamas intensifies attacks on Israeli settlements in the West Bank which are to the east of the Protective Barrier (named "The Wall" by Palestinians). - Israel closes all crossings at the West Bank checkpoints and suspends movement from Gaza to the West Bank. - In response all Palestinian terrorist factions intensify attacks on Israel through the recruitment of Israeli Arabs so as to obviate the need to cross the closed and heavily guarded checkpoints. - The Wailing wall is breached from the Al Aqsa side, a part of it collapses. - The Israeli government responds by declaring an internal emergency and clamps down on all Israeli Arab localities inside Israel. 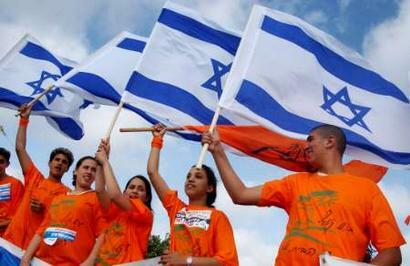 - Movements of Israeli Arabs is restricted to within these localities. - Israel withdraws settlers from West Bank settlements which are to the East of the Protective Barrier (named "The Wall" by Palestinians). - With American acquiescence, Israel launches firebombing raids over Gaza West Bank and over Arab- Israeli localities inside Israel movements out of which has been clamped down. - With the Gaza and West Bank having been cleared of all Jewish residents, the casualties among Jewish Israelis is negligible. - Sharon re-joins Israeli cabinet and reveals that the plan to withdraw settlements from Gaza and then the West Bank followed by internment of the Israeli Arab population was a part of a long term strategy to separate the Jewish and Arab populations before the launching of decapitation strikes against the Palestinians. - This strategy was decided upon after the failure of the successive Peace Accords starting from Oslo Peace Accord, the Barak-Arafat negotiations at Camp David, the Wye river Accord, the Sinai Peace Accord between Sharon and Abbas, leaving no scope for any successful negotiation with the Palestinians for a peaceful two state solution. There was a suicide bus bomb explosion yesterday. In China, there were more than a thousand reported bombings last year. Most go unreported by the country's tightly-controlled state media. The Fujian bombings imply that islamist terror in China is spreading to other parts. There have been reported low-intensity bombings in Beijing in 2003, when the authorities issued an alert to look out for people sporting beards. Bloggers from China are reporting that the suicide bomber has blown up a bus in Fuzhou City, Fujian Province, at around 2:30pm, August 8th. According to Peacehall.com, police have confiscated the cameras of those who took pictures. We first learned of this from Aaron at Hagganah Internet.Anonymous witness said there were at least five killed, some said more than 20. The shockwave from the home-made explosives was so huge that the windows of a nearby store shattered, according to the sohu.com website.... Police later said the explosion came from a second-row seat on the right-hand side of the bus. Police are still investigating the case. Chinese sources seem to raise doubts on the official government version of the story. It's not clear to what extent that these doubts are based on legitimate knowledge or simply on a general disbelief of anything said by the Communist government. There were more than a thousand Islamist reported bombings last year in China. Most go unreported by the country's tightly-controlled state media. In Feb 25 1997: three blasts on buses in Urumqi, capital of Xinjiang province, killed nine and injured 74 and were blamed on Moslem separatists. In Aug 1998: a handful of bomb blasts were reported in Xinjiang province, possibly by Moslem separatists.